An early draft of the Uniform Monday Holiday Act would have renamed the holiday to "Presidents' Day" to honor the birthdays of both Washington and Lincoln, which would explain why the chosen date falls between the two, but this proposal failed in committee, and the bill was voted on and signed into law on June 28, 1968, keeping the name as Washington's Birthday. Retrieved from http://en.wikipedia.org/wiki/Washington%27s_Birthday 2/13/15. When I read this article I thought how amazing it is that an amendment that failed still became a "functional" informal dictate! Maybe it was advertisers or whatever but I would bet that most of you reading this article thought as I did that February 16, 2015 is the day we celebrate the birth of two US Presidents! Gives you pause to think that no matter what happens in Congress, the masses can still rule. I am not sure how I feel about that, but it is an interesting phenomenon to think about this Monday morning! Speaking about Congress ... Phyllis Wolfram (MO), Policy and Legislative Chair, and her awesome committee have put together CASE Legislative Platform and the ESEA Recommendations that were submitted Feb. 2, 2015 to the committee. We will have them up on the CASE website soon but you can access the 2014-15 CASE Legislative Platform by clicking here and the revised ESEA Recommendations by clicking here. Thank you for all the input you provided to this committee and especially thanks to the hardworking P & L Committee, chair included! Last week's poll was about restraint and seclusion! 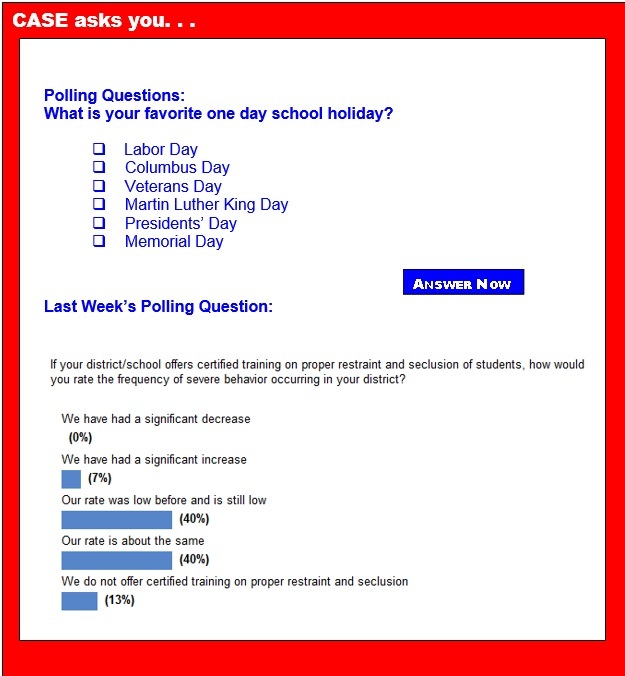 This past week the poll question was, "If your district/school offers certified training on proper restraint and seclusion of students, how would you rate the frequency of severe behavior occurring in your district?." There was a tie for the number one answer: both "our rate was low before and has remained low" and "our rate remained the same" came in at 40 percent. Thirteen percent indicated their district does not offer certified training and 7 percent indicated they had had an increase in incidents! Did you know CASE has a Lucky 21 on Restraint and Seclusion? To order your copy, click here! Don't forget Education Talk Radio is one more resource available to you! Mark your calendar for Monday, Feb. 16, 9:00 a.m. ET (8:00 CT/7:00 MT/6:00 PT/5:00 AK, 4:00 HI time!) when Larry Jacobs will be interviewing me about what is going on in the world of CASE! Education Talk Radio is on the web at www.education-talkradio.org for PreK-12 and for Higher Ed at www.highereducationtalkradio.org. They do dedicated interviews about the world of education daily and Luann and CASE are always welcome guests, as the many other professional educational associations, thought leaders, education companies and education professionals; teachers, administrators, etc... Every show done is archived at the sites and future schedules are also there. We tweet '@edutalkradio' and announce all shows there as well ... Thank you. P.S. It still isn't too late to be a Virtual Site for the 4th Annual CASE conference! And even if you do not participate, you can follow the discussions on Facebook.com/casecec or Twitter @casecec #2015CASEWinter Remember even if you don't Tweet, you can read the tweets at www.casecec.org! 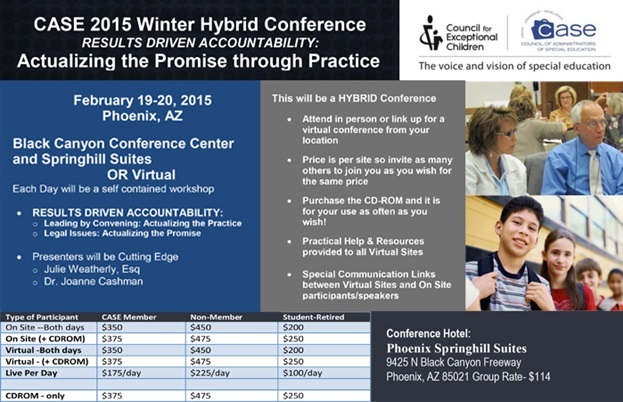 SPECIAL NOTE TO THOSE WHO HAVE SIGNED UP TO BE VIRTUAL SITES: You should receive an email today on Monday, Feb. 16 if you have not already that will explain how to access the handouts for the 4th Annual CASE Hybrid Conference. If you do not receive that email by 4:00 p.m. ET Monday, Feb. 16 please contact Luann Purcell at Lpurcell@casecec.org! President Barack Obama is committed to providing all children including those with disabilities access to high-quality preschool opportunities. And although strong progress is being made, there is still much more to do to ensure that all children have access to high-quality early childhood programs from birth. The United Nations Global Education First Initiative are now accepting submissions for a global art campaign that aims to raise young people's awareness of disabilities and inclusion. GEFI, partnering with the Global Observatory for Inclusion, and the GEFI Youth Advocacy Group, have launched the #DrawDisability campaign and invite children and youth to reflect on the lives of Persons with Disabilities, through drawing. The Center on Enhancing Early Learning Outcomes released a new FastFact sheet entitled QRIS and Inclusion: Do State QRIS Standards Support the Learning Needs of All Children? This sheet reviews which states accommodate children with special needs in their quality rating and improvement system, and highlights states with exceptional inclusionary practices. Some students with disabilities may get a chance to leave the public school system here — but advocates and parents aren't sure it will improve their education. Lawmakers in Mississippi will soon debate a bill to give special education students vouchers for private schools, which supporters say will boost their options and opportunities. Opponents, though, say vouchers will simply send students with disabilities to ill-equipped, unregulated schools and ultimately absolve the state of responsibility for some 54,000 students with disabilities. Natalie Pollard couldn't understand why her son, Aran, was having an especially hard time learning to read in first grade. Aran had a good teacher. He had supplemental instruction. He studied long hours after school with his mother. But his progress was slim. In fact, many times he seemed to be losing ground. "I was at a loss as to what to do," Pollard said. The summer before Aran entered second grade, the Pollard family met a dyslexia eduction specialist who had moved into their Layton neighborhood. Not long after, an answer emerged: Aran had moderate dyslexia. People with attention deficit hyperactivity disorder, some studies suggest, are more creative and more willing to take risks. Those traits are exactly what the field of engineering needs, say a team of researchers, but the traditional model of teaching is driving away potential pioneers in the field. With funding from the Research in Engineering Education, a program of the National Science Foundation, they're embarking on a study designed to find a better way to teach these students. How do we know that a student is learning? What behaviors must they demonstrate for the teacher to draw the conclusion that the student has learned? Who determines learning? The teacher, the curriculum and the standards do. The current measure of learning is assessment. The student must indicate what they know by answering questions in a test format. However, there is a piece missing that is important to determine if a student has learned and is learning. Education groups are fighting a proposal on Capitol Hill that would allow federal funding to follow disadvantaged students to the public schools of their choice — an idea that school district advocates see as a pit stop on the highway to Voucherville. The policy — known as "Title I portability" — is included in a draft bill to reauthorize the Elementary and Secondary Education Act introduced by U.S. Sen. Lamar Alexander, the Tennessee Republican who chairs the Senate education committee. President Barack Obama's FY 2016 budget request includes four focus areas for education, including increasing equity and opportunity for all students; expanding high-quality early learning programs; supporting teachers and school leaders; and improving access, affordability and student outcomes in postsecondary education. Education Technology State Grants would receive $200 million to support models that use technology to help teachers improve instruction and personalize learning for students. It's not easy to predict what will happen in an adapted physical education class. Some of the students might be focused and on task, others might dart away in the middle of a game, and still others might prefer to sit in the corner or lie motionless in the middle of the mats. But it is up to the Beaverton School District Motor Team to get the kids up and moving. The time has finally come to end the separation of special education students and general education students, researchers at the University of Kansas argue in a new publication. Not only does research show that all students have higher achievement levels in fully integrated environments, but support and public policy for schools to make such a switch are coming into place as well. Access to state-supported early childhood programs significantly reduces the likelihood that children will be placed in special education in the third grade, academically benefiting students and resulting in considerable cost savings to school districts, according to new research published today in Educational Evaluation and Policy Analysis, a peer-reviewed journal of the American Educational Research Association. College can seem out of reach for students with intellectual disabilities, but some area colleges and universities are offering programs to make it a reality. Not only are these students getting a taste of the college experience, they're acquiring the skills and knowledge necessary to succeed in the workplace while matching them with careers to best fit their talents. We've all inhaled sickening exhaust fumes when driving behind a diesel school bus. But those fumes can also get sucked inside the bus, exposing children to high levels of pollution. Riding such "leaky" older school buses can lead to respiratory illnesses and even cancer, which is why the Utah legislature is considering legislation to replace 450 of the worst-polluting buses in its 2,500-vehicle fleet.